New York (TADIAS) – More than two years ago, New Yorkers Liyuw Ayalew and Sam Saverance hosted a party in Brooklyn to launch their pop-up Ethiopian Vegan restaurant named Bunna Cafe. Their mobile restaurant could be found at street fairs and at Smorgasburg — Brooklyn’s Flea Food Market — and dozens of other locations in the city. As the popularity of their Ethiopian dinners, layered fruit smoothies (Espris) and traditional coffee ceremonies grew strong the duo decided to scout for a permanent location and found a place on Flushing Avenue in Brooklyn. They are keen on revamping the bar top, storefront as well as furniture, and building a stage surrounded by a half-hut to host the Ethiopian coffee ceremony and live music. This past December they launched an indiegogo campaign for the permanent restaurant. TADIAS: Please tell us a bit about how you started Bunna Cafe. Who are the main individuals behind it? Your mission/goals? BC: Bunna Cafe is a partnership of Liyuw Ayalew and Sam Saverance. Liyuw had spent years managing restaurants and coffee shops, and also worked deep in the tourism industry back in Ethiopia. Sam has a graphic design and publishing background and spent some time in Ethiopia to working on launching an org to teach people graphic/web design and desktop publishing. We came together two years ago with a desire to do something unique, creative, and authentic with Ethiopian cuisine and coffee in a way that adequately reflects our own dining experiences. We felt it was important to emphasize the family-oriented feel of eating together, and not least, the sensual experience of the coffee ceremony. We also decided to focus on the vegan tradition of Ethiopian cuisine, which was something we both deeply appreciated despite being meat eaters. Our vegetarian chef Kedija Srage provided an amazing set of recipes from her cooking experiences and helped us get going as a functioning pop-up restaurant. TADIAS: You started Bunna Cafe as a pop-up at various locations in New York City. What was that experience like? BC: We started by doing secret dinner parties in Bushwick, Brooklyn. While there are very few Habesha and no Ethiopian cuisine to speak of in this area, most people there were at least a little knowledgeable of the food and were eager to experience it again. So we found a strong home base there very quickly. Soon we were arranging pop-up dinners at bars and cafes around Bushwick and Williamsburg as well as street markets and major events. When we did a popup or dinner, we made sure to perform the coffee ceremony whenever possible. Also we would bring in musical entertainment of a variety of genres, including Ethiopian performers such as Tadele Daba and Girma Yifrashewa. The feeling was amazing — we were able to be creative with each event we performed, and we quickly began to see regular customers. But perhaps more impressive, we would see people who had attended one of our early dinner parties appear two years later saying they had been keeping track of our progress all this time and were eager to make time to pay another visit. TADIAS: What made you decide to get a permanent place? Can you tell us a bit more about your current crowdfunding campaign? BC: We have always planned on opening a permanent spot. Being a pop-up was a strategic decision for the moment given our lack of funds and the need to build a following. Now the time is right to make the switch to being a restaurant. However, we are still intending to pop up even when we open doors. We will focus more on elegant, well-crafted dinner and entertainment events, coffee and coffee ceremony-oriented events, and also on emerging further outside of our corner of Brooklyn, into Manhattan, Harlem, Queens, and New Jersey. In July we began operating as a pop-up lunch counter in a southern food restaurant/bar called Mama Joy’s. They only worked dinner service so we were able to take daytime hours for a nominal rent. In November, Mama Joy’s went out of business and we took the opportunity to take over the space. After a whirlwind negotiating period we took over officially in mid-December. There was no time to get a bank loan so we are renovating off of our cash reserve. To supplement this we decided to launch an Indiegogo crowdfunding campaign and get our supporters invested in our growth. There has been a great response so far and with 22 days to go we are pushing hard to reach our goal of $15,000. People can learn more and contribute at http://igg.me/at/bunnacafe. TADIAS: What is one thing you absolutely enjoy about running Bunna Cafe? BC: Not to sound like a cliche, but we love everything about it. Perhaps the greatest thing though is seeing the overwhelmingly positive and amazed response from our customers to the food, drink, and ambiance. It cannot be denied that Ethiopian cuisine is growing in popularity in this country and the world. Being a part of that growth and seeing people react positively and with overdue respect to Habesha culture and identity is something that is invigorating and something that gives us hope for the future. 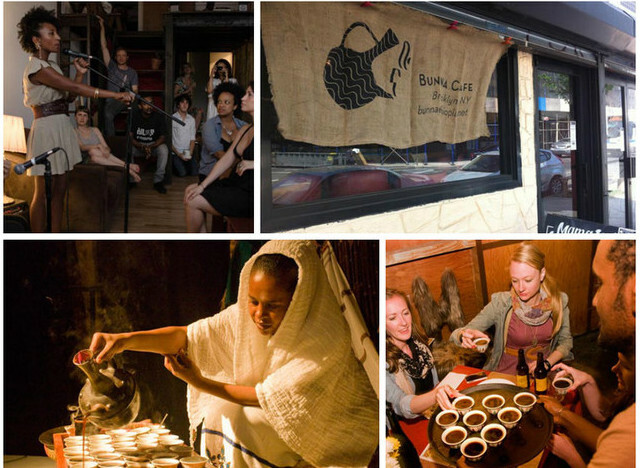 You can learn more about Bunna Cafe at their website www.bunnaethiopia.net. You can support their indiegogo campaign at http://igg.me/at/bunnacafe.